Artificial sweeteners are always a “hot topic” and many people tend to have strong feelings about them, one way or another. It seems like every other month we get a report on the latest study on what artificial sweeteners do or don’t do to us. The data alternates between saying artificial sweeteners are good for us or they are going to kill us – so which is it? It can be hard to know what to believe and what to do, especially if you have diabetes and see artificial sweeteners as a healthy alternative. They seem like a great option for lowering calories and carbohydrates, but are they too good to be true? Let’s look at some of the claims, myths and facts related to artificial sweeteners. We’ll start with the basics. Artificial sweeteners, also called sugar substitutes, were originally created to help people lose weight and manage diabetes. They were thought to be a great alternative. Saccharin was the first artificial sweetener, accidentally discovered by scientists at John’s Hopkins. Eventually there were concerns over the safety of saccharin based on studies done in rodents. Even though the FDA was leaning toward banning it, but they didn’t, and it was partially because of consumer uproar over that possibility. The final ruling was that saccharin was only required to have a warning label about cancer, but could remain on the market. In 2000, the warning label was removed because they could only prove its carcinogenic affect in rodents and not in humans. You will still find saccharin “the pink packet” on the market today. Now, we have a total of 8 sugar substitutes. There are two different kinds, nutritive and non-nutritive. Nutritive means it adds to the caloric value of food and it contains more than 2% of the amount of calories that you would find a comparable amount of sugar. Non-nutritive means it does not contribute to the total calories in a food, or has less than 2% of the calories found in comparable amount of sugar. Aspartame, “the blue packet” is the only nutritive sweetener, meaning it does have some calories. There are eight artificial sweeteners on the market and six are approved by the FDA to be food additives, 2 are considered GRAS (generally recognized as safe), but not approved by FDA as food additives. You can check out the chart below for more details. A study was published in Diabetes Care in 2013 that showed how Sucralose “the yellow packet” caused an increase in glycemic and insulin response. I think this particular study stands out because of their subject selection. They chose people who were obese and who were not actively consuming artificial sweeteners. So it was a brief and new introduction into their body. This study concluded that Sucralose creates a physiologic response that causes the blood sugar be higher. 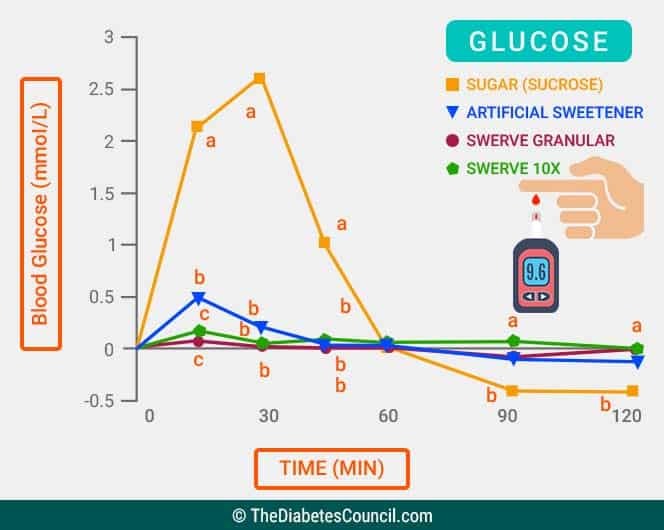 In this study the Sucralose was consumed 10 minutes prior to a 75g oral glucose load and the control group had water instead of a drink with Sucralose. Those who had the Sucralose showed more insulin resistance. Diabetes & Ketogenic Diet: Can You Manage Your Diabetes On A Ketogenic Diet? How Can Your Diabetes Affect Your Friends, Family &amp; Others Around You? Closed Loop Systems: Future Treatment for Diabetes? Say what? Something without sugar affected blood sugar? YES! The body actually had to put out more insulin to handle the same amount of sugar, when Sucralose was given. But, downside to this study is that there were only 17 people. Let’s look at a study that is a little bit bigger. The next study had approximately 6,800 people in it. This study shows a positive association with diet drinks and metabolic syndrome (high blood sugar, high blood pressure, and high blood cholesterol). This study states that daily consumers of diet soda had a 67% elevated risk of type 2 diabetes compared with non consumers. Why? Well, this study is different, it wasn’t looking at the actual artificial sweetener itself and how it may or may not change the body on a metabolic level. This study shows a positive association with drinking the diet soda. So, this could mean that the sweet taste of the diet soda makes the body crave more sugar (physiologic response) or it could mean that because people drink “diet drinks” it’s a free for all when it comes to food (environmental/behavioral response), we don’t know. Note: this did not differentiate between which artificial sweetener was in the drink. This data was collected from a food frequency questionnaire given to the subjects. So far, we have interesting studies, but nothing so definitive to call for a ban of artificial sweeteners. OK, there has to be something better out there. Some amazing data has to be creating such a frenzy of feelings around this topic. There sure is! And this time it’s all about the gut. Researchers have found that artificial sweeteners alter gut bacteria and can make rodents more susceptible to glucose intolerance. Wait, what? Rodents again? So, maybe those weren’t the study subjects that we are looking for, but at least we are making some progress. We are starting to put the pieces together of a very complicated puzzle. What do we think we know? We now know at least one artificial sweetener, has a physiologic/metabolic affect on insulin resistance and glucose metabolism. We have some insight into how artificial sweeteners may alter the gut bacteria, possibly setting us up for disease. We absolutely know that diet soda has a positive association with increased risk for diabetes, what we don’t know is the true cause/effect. The other piece to think about is, artificial sweeteners are in everything! If it says light, lower calorie, low carb, or sugar free, there’s a pretty good chance it has artificial sweeteners in the ingredients. Many people have several items in their fridge or pantry that contain artificial sweeteners and may not even realize it, it’s not just diet soda. So, how much is too much? The chart shown earlier makes it seem as though you can go crazy with them, given the adequate daily limits. But this might be one of those things where less is more. So, from the chart above, monk fruit and advantame look like the winners, for now. The interesting aspect about advantame is that it is so very sweet, that the most minuscule amount is used. This could lead us to believe that any possible threat it would have, could be minimized because of the small amount it takes to make something sweet. Monk fruit just doesn’t have a whole lot of data yet, we do know that they have been using this in China for many years. There are so many things that pregnant women cannot do or consume during pregnancy. Do we need to add artificial sweeteners to that list? The general consensus is that sugar substitutes are OK during pregnancy. But, in 2010 there was an alarming study that showed women who drank one serving of diet soda a day were 38% more likely to deliver preterm than women who drank no diet soda at all. There have been some studies in primates and rodents pointing to a possible link between aspartame and pre term delivery. So, with no strong evidence, the American College of Obstetricians and Gynecologists state that use of artificial sweeteners in moderation can continue during pregnancy. Once the baby has been delivered, it’s important to know that Saccharin, Sucralose, and Acesulfame-K all pass into breast milk. Sucralose passes through in a large enough amount to actually make breastmilk taste sweeter. When the FDA sets regulations for the “acceptable daily intake” for artificial sweeteners it’s usually calculated on mg/kg. So, a young child could easily surpass that level by eating “light yogurt” and drinking a couple diet drinks. So, for a child with Type 1 diabetes, this could be a really big deal. Error on the side of being safe rather than sorry. I would recommend general avoidance of artificial sweeteners in pregnancy and breastfeeding, if possible. The most popular artificial sweeteners being used by women in the studying linking artificial sweeteners to pre term labor were Acesulfame-K and Aspartame, so at the very least, avoid those during pregnancy. While breastfeeding, avoid or reduce intake of Sucralose, Acesulfame-K and Saccharin. In children, I would recommend avoidance or at the very least, stick to lower risk artificial sweeteners and treat the product with artificial sweetener as a treat and not a free for all. 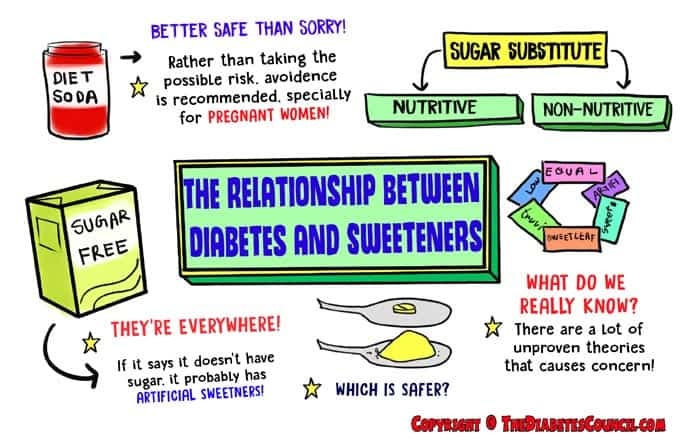 Now that we have reviewed some of the literature, let’s look at artificial sweeteners from a common sense and historical approach. Common sense tells us that consuming foods close to nature, meaning food that we can hunt, fish, grow, and/or pick tend to lead us toward optimal health. Foods that are overly processed and have long ingredient lists, that we cannot make sense of, tend to lead to more health problems, if consumed on a regular basis. Artificial sweeteners generally are not close to nature, that’s why we call them artificial. There are possible exceptions, Stevia and Monk Fruit come from nature, but the form that has been GRAS has been processed and is not the same as a tincture/extract that may have been obtained from the actual plant/fruit. Historically, when something seems too good to be true, it probably is. So, I ask you, based on this information, would you choose to continue using artificial sweeteners, cut them back as an “occasional” food or treat, or completely eliminate them? Maybe you are even starting to think that some sugar substitutes are better than others? Now What, Are There Better Options? Artificial sweeteners aren’t the only game in town. There are also sugar alcohols. Sugar alcohols are not quite as sweet as sugar or artificial sweeteners. They tend to be more stable in baking. They can impact blood sugar, but not as much as sugar. So a good rule of thumb is, whatever the amount of sugar alcohols on the food label, subtract half of them from the total carbohydrate count. You are subtracting the amount that is not absorbed, which leads us to the downside. If you eat too much sugar alcohols, they can cause a laxative effect and maybe some gastrointestinal upset. You will know if something contains sugar alcohols because it will be listed on the food label under carbohydrates. If you read the ingredients, sugar alcohols typically end in “-ol”. Such as sorbitol,mannitol, malitol, xylitol, erythritol, and lactilol. The FDA actually requires a label stating this on any food that exceeds 50g of sugar alcohols. So, while these are generally safe, if used in excess, you may end up spending a lot of time in the bathroom. Swerve is an example of a sugar alcohol that you can buy to add to your food/drinks. Many of the large organizations such as the American Diabetes Association and the Academy of Nutrition and Dietetics support the use of artificial sweeteners in moderate amounts, in children and adults. You saw earlier in the chart the number of packets you would have to exceed each day, and it was a lot. So, my best advice is to listen to your body. Pay attention to how you feel, do you notice differences in your blood sugar results, are you exhibiting any other symptoms that you are concerned about? Artificial sweeteners are optional, so you can avoid them if you choose. You can use them if they benefit you. At this point, there is not enough data to give a right or wrong answer. 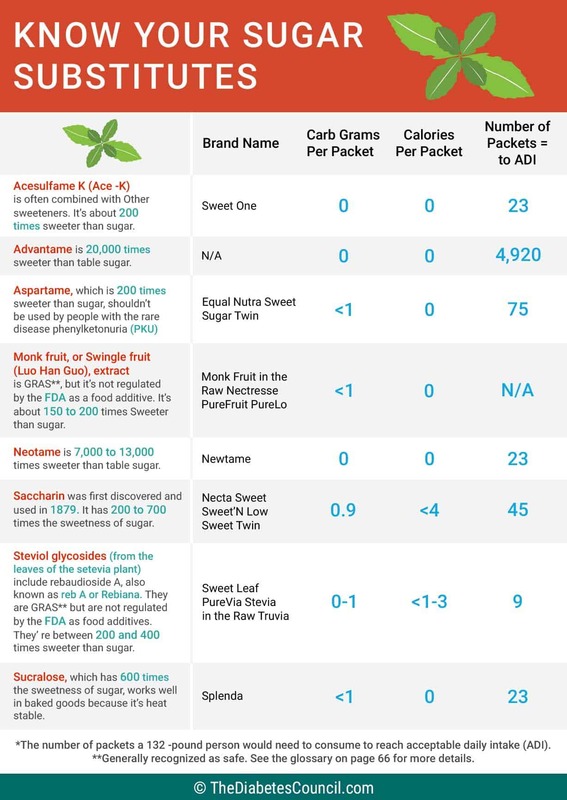 If you are skeptic about artificial sweeteners, but still on the fence, then consider Stevia, Advantame, Neotame, and Monk Fruit. Realize that more studies need to be done, but if used moderately, these may be less risky options for those who are skeptical. My best advice to you is keep it as real as you can when it come to nourishing your body. I know this is a very controversial issue and my goal is to provide you with information to make an informed decision on what is best for you and your health. Hopefully in the future we will have better data to base our recommendations. The Prevalence Of Diabetes In Minority Groups – Are Some Ethnic Groups More Affected With Diabetes Than Other Groups? I have no financial disclosures when it comes to artificial sweeteners or sugar alcohols. I am a member of the Academy of Nutrition and Dietetics and the American Diabetes Association. When I am working with patients I believe it’s important to individualize care and meet people where they are. It’s important to understand people and their beliefs and take that into account when making recommendations. Gallup Report Shows Diabetes increasing at Disturbing rates in the U.S.
Angela Manderfeld is a certified diabetes educator, a registered dietitian and Board Certified-Advanced Diabetes Manager. She specializes in weight management, and diabetes education. I would like to know if you have ever received money for any reason from any company that makes money from natural sugar whether it be cane sugar or high fructose corn syrup or anything else. I’m tired of “researchers” either cherry picking the studies they use for their papers of outright fudging data. Knowing where you get your funding from is important in determining the validity of your conclusions. Chuck we are so sorry to inform you that TheDiabetesCouncil.com is not interested in Ads nor in receiving money from companies to promote their products or agenda. We get emails from some of the most popular pharmaceutical companies that generate billions of dollars in revenue asking us to promote their products but we decline. The original question was about financial disclosures related to natural sugar. The disclosure statement in the article references only artificial sweeteners and sugar alcohols. The response to the comment declares a general commitment to no advertising (which is heartening), but still doesn’t rule out any financial interest in natural sugars. A response to this comment or a revision of the disclosure statement which explicitly declares financial independence from natural sugar industry would be most welcome. Thank you. What’s there to declare Deb? Are you saying natural sugary industry paid for this piece? I wouldn’t bother with natural sugar industry, if money was goal I know natural industry can’t even match 0.01% of what a pharma will pay to push their story. So there is no need to mention anything. We have no interest in pharma or natural. The story was written to cover the topic from every angle. Thanks for your comment. I wrote the article and have never received money from any food industry company and have not participated in any research related to this. Just trying to help people make sense of all the information out there. I ask a valid question and my previous comment gets censored. I think that in itself answers my question about the validity of this paper. Patience is not a good thing but a great thing. We get 100s of comments on daily basis and we approve comments after 24 – 48 hours. There is no censorship on this website, next time you comment give our team 24 – 48 hours to get back. If sucralose is just sugar designed to pass through without contributing carbohydrate, why is it lumped with all the other chemicals? Are there studies that show anything that appears to be direct cause/effect in an increase in A1C levels when using sucralose / Splenda? If using sucralose / Splenda causes increased A1C levels by indirect action (such as altering gut bacteria levels), could those negative effects be mitigated by a concerted effort to avoid starches and sugars while still using sucralose / Splenda? I.e., can we have our Splenda-sweetened coffee, tea and soda pop (thereby lowering calorie intake in one area of diet, and simultaneously avoid an indirectly-caused increase in A1C levels by using prudent amounts of starch and sugar containing foods in other areas of our diet? First, I want to thank you for this article… it was very informative. It also left me questions about the ‘gut’ thing… more research on my part is required, and your link to such is much appreciated. Now then, I’m a Type II Diabetic (66-years-old and just diagnosed). I use a Sucralose liquid (Brand Name: EZ-Sweetz). This is what it says on the back of the package: INGREDIENTS: Filtered Water, Sucralose, Potassium Sorbate, Sodium Benzoate, Succinic Acid, Citric Acid. Your article only references Splenda (in the packets) as a Sucralose artificial sweetener. I was wondering if there is any difference between the liquid EZ-Sweetz I use and the powdered Splenda you reference? Thanks for responding. Well this article has convinced me to reduce my intake of artificial sweeteners by avoiding packaged foods and adding less sweetener to my coffee and breakfast cereal. Where Does The Future Nutritional Breakthroughs Lie? Where Do I Begin With Prediabetes? Where Do I Begin With Type 2? Where Do I Begin With Type 1? 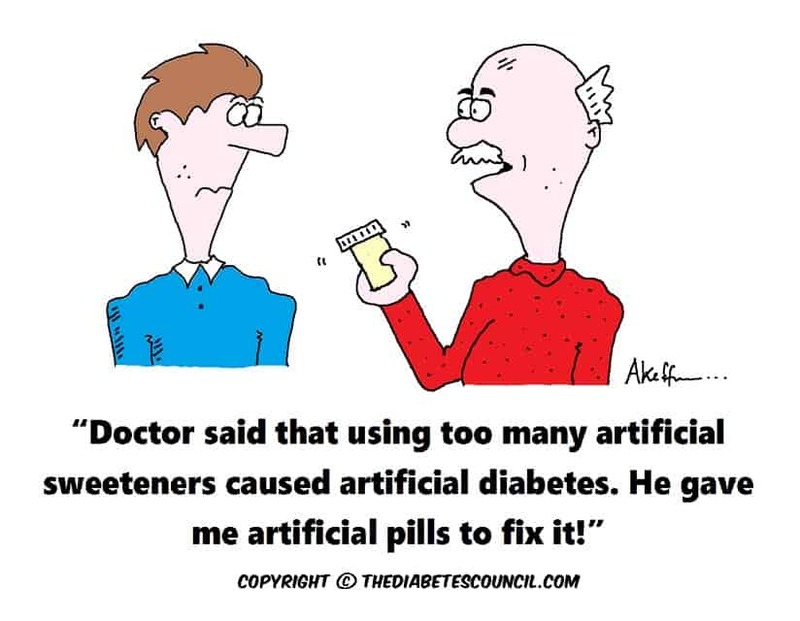 Copyright © 2016 – TheDiabetesCouncil.Com - All rights reserved. No content on this site may be reused in any fashion without written permission of TheDiabetesCouncil.com. The material as well as pieces of information are designed to help and assist, not substitute, the relationship which exists between you and your physician. See a certified medical professional for diagnosis.